follow me home: Mother-of-the-year, Volume 65.. 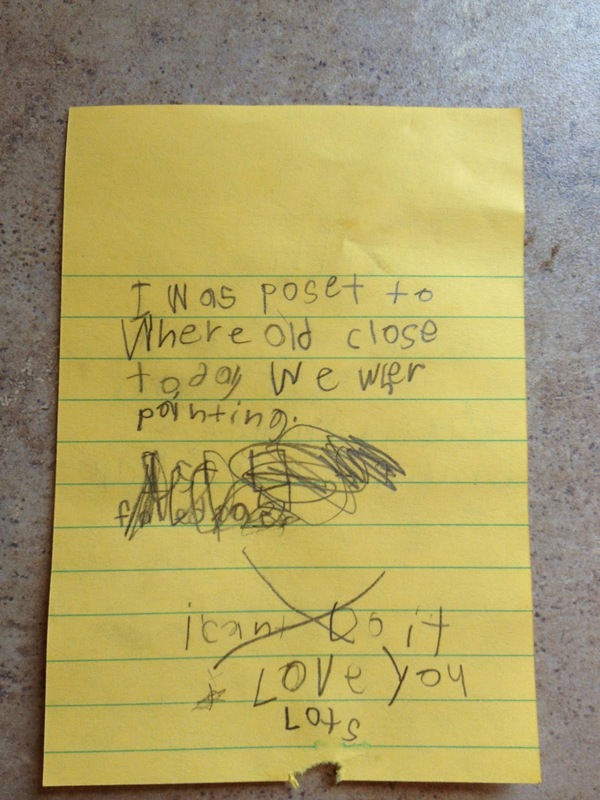 I received a note from my youngest yesterday after school. He was trying to be quiet because I was working with a student who was reading to me. I tutor on Wednesdays, and the youngest usually works on his own homework until I'm finished. Apparently, this couldn't wait. "I was suppose to wear old clothes today. We were painting." I believe the part that is scratched out said, "You fail as a mom. How could you forget to dress me appropriately for an important art project? I am sincerely disappointed in you. You are a stay-at-home-mom now for a reason- so you can pay attention to the tiny details. I notice that you didn't forget to make that hot cup of coffee for yourself or wear appropriate clothes for yoga. But that's okay. What choice to I have, but to sit and wait for you to say you're sorry?" And then he changed his mind, writing "I can't do it." (I can't break your heart) With an asterisk. "Love you lots." Maybe the scratched out part didn't say that, but still...That is how I felt. I forgot Art day (his favorite)! He was concerned enough to let me know and still was able to say "love you lots" at the end. Ugh. Happy "Step-up-your-game, man!" day, friends. Thanks for the laugh! I was so excited to see a new post, just when I need a little diversion and fun! Next week is coming so fast. I'll send some pictures, especially me at the rehearsal dinner wearing the bling I won on your blog!! So happy that you love your bling! I wear min to take out the garbage... HAHA. Thanks for taking the time to write. Oh Nick Nack, don't we always belong at the back of the room? That's where all the fun happens anyway. I'm fortunate to have such amazing friends who are willing to admit they're not perfect. Most of us are not even close. Isn't that what makes it so fun? We try and we mess up, but at the end of the day, they still love us lots. awww, I love you sis. Give yourself a break, you are an amazing Mommy. To be a parent does not mean you have to be perfect, only try your very best. You do that far more than what happened yesterday. He said that he loved you in that letter, and he has great reason to. Thanks for the smile and the reminder that every one of us is trying. We do what we know.We use what we have... Gosh, I miss Oprah. hahaha ...love you sis. I think he was just looking at the big picture. We all forget things from time to time but need to remember to put those things in perspective. I'm sure he was able to complete his art project just fine with the clothes he had on. And on Mother's day, when you see him beaming with joy and pride in giving you a gift that he made myself and from his heart, a little oversight like this will be long forgotten but the "love you lots" part will be fully understood.